Vasil Kunchev was born on July 18, 1837 to the middle class family. Before emigration he became an Orthodox monk to join the two Bulgarian Legions in Serbia and other revolutionary groups. He acquired the nickname Levski, that means “leonine”. 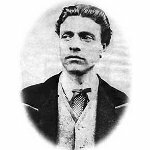 Vasil Levski is honored for this revolutionary theory, that saw the Bulgarian liberation movement as the national uprising of Bulgarians in the Ottoman Empire. But his idea was not accepted by the entire population of Bulgaria. Many regarded, that intervention by the great powers was a more feasible solution. Levski was ready to sacrifice his life for liberation of Bulgaria. He placed interests of the Bulgarians above his personal interests. At the same time he didn't see himself a national leader or an official. He just planned to assist other oppressed people, when liberation of Bulgaria would be reestablished. Levski was arrested by the police in December 1873. The Ottoman authorities sentenced Levski to death by hanging. He was executed on February 18, 1873 in Sofia.